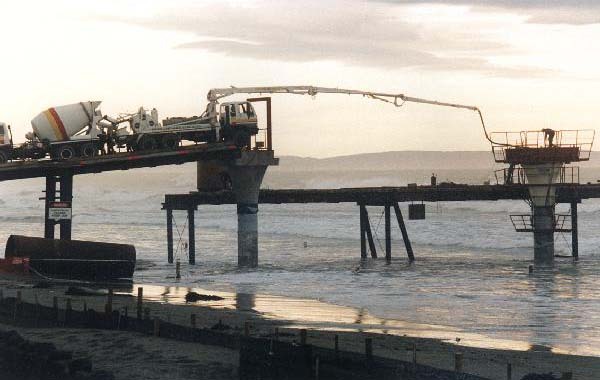 The pier was officially opened on 1 November 1997, on the site of the original New Brighton Pier which had been demolished more than 30 years previously. It is the biggest ocean pier in Australasia. 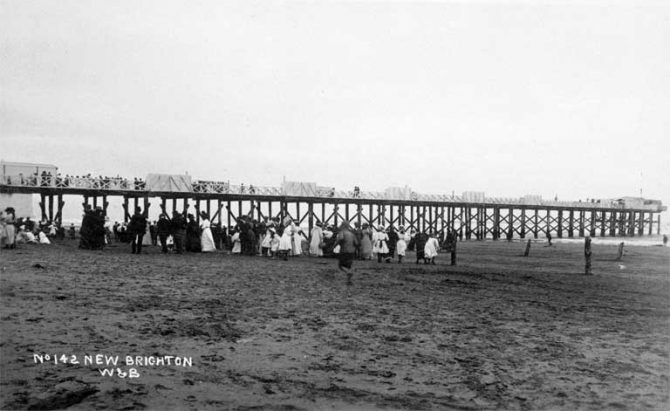 In 1894 the first New Brighton Pier was opened and for the next 70 years it provided the citizens of Christchurch with a recreational destination in the traditional British style. Along the way the pier had a “penny arcade” full of games and amusements and even a nightclub, the Shoreline, at the shore end. The pier complemented New Brighton’s role as a favourite seaside outing and, for many years, as the only place where you could shop on Saturdays. The original pier was built of wood. Original grand designs were for the pier to be 600ft long with a 100ft octagon at the end. Rising from this was to be a large pavilion with a landing stage for use at high or low water. The whole was to be protected by a double breakwater. The first pile was driven in 1891 and the completed pier was opened on January 18, 1894 by the Governor General, Lord Glasgow, in the presence of large crowds who travelled to the beach by special trams. These historic photographs of New Brighton show the pier over the years. By 1965, the pier had become so run down that the council ordered that it be demolished. On the night of October 12, between 2.30am and 7am workmen from Ryan Brothers, using a bulldozer, demolished the pier, starting at high tide and following the tide out. About 100 20 ft piles were winched out or cut off 18 inches below ground level. A group of residents who had formed the Pier and Foreshore Society to try to save the pier continued to campaign for a new pier. Thirty years of lobbying and fundraising in the community saw almost $2 million raised from the community which was matched by a further $2 million from the Christchurch City Council and a new pier design was approved with a new library, a café and a restaurant at the landward end. The striking library building was completed in 1999 and has won many awards. The pier is the setting for an annual Guy Fawkes fireworks display and is used for fishing. The new pier was designed to be a place where people could feel close to the ocean. Much of the pier's length is out over the water, even at low tide. To celebrate the tenth anniversary of the opening of the New Brighton Pier on 21 June 2007 the structure became a permanently lit icon of the city’s coast. LED lights along the underside of the pier were switched on, bathing the pillars the length of the pier in a combination of red, green and blue lights. This effectively lights all the columns and the sides of the pier structure creating a dramatic display of colour which is also reflected in the water. The Burwood-Pegasus Community Board commissioned lighting expert Grant Robertson to create the work. 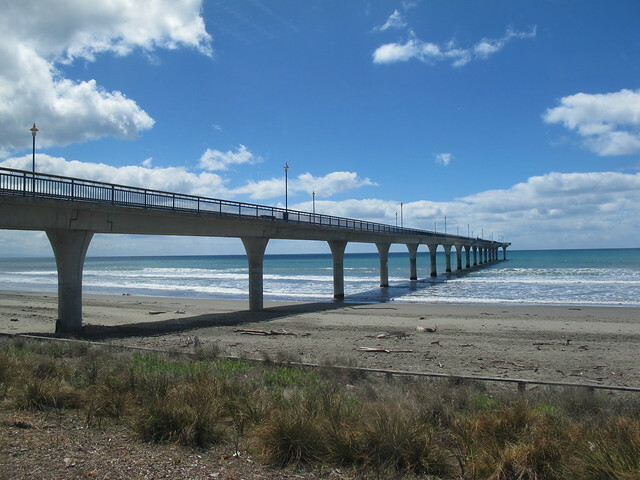 The pier suffered some damage as a result of the 2011 Christchurch earthquakes. Repairs will focus on damage sustained by the support columns at seabed-level, and there will be additional repairs to cosmetic earthquake damage on the deck and railings. Repair work began on 30 January 2017 and is due to be completed by early 2018. The pier will be open for use throughout the period of repair. New Brighton Pier Construction - photo tour of the Christchurch Pier construction process, which displays images from the first day of construction to the official opening.